Friends, how have I managed to go all of these years without posting a simple pumpkin pie recipe? I’m a little baffled, but took the right steps to fix this embarrassing issue just for you. Millions of pumpkin pies are eaten on Thanksgiving every year, Costco sells around 1,000,000 on the holiday alone and confirms why nobody should go near the store at that time! I love Costco but when it’s busy it’s freaking insane. 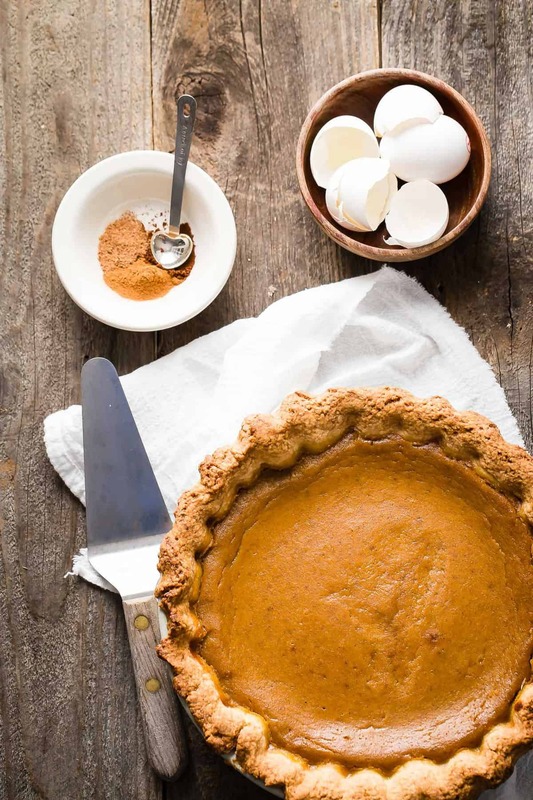 Keep things simple when you’re making your pumpkin pie. Yes, you can find pies with fancy crusts, some with booze and some with crumble tops but I like my pie the old school way with a dollop of vanilla whipped cream on top. It’s perfectly normal to keep your pies booze free and just drink it as you’re mixing, someone else told me. The crust is important and usually what gives me the biggest headache, but this recipe is pretty easy. Leave a lot of overhang on the crust and don’t worry too much if it doesn’t look totally perfect. We’re not going for perfect here, we’re aiming for flavor. Brown and white sugar is whisked with eggs, cinnamon, nutmeg and cloves. Add the eggs and see the sticky brown mixture start to come together. But it needs pumpkin so let’s add some…and heavy cream. Pour the orange mixture into your beautiful homemade pie crust and transfer to the oven, all while watching for small dogs around your feet. Yup, almost no pie made it to the oven. Bake until the center of the pie is still jiggly but soft. As it cools it may crack in the center, but don’t freak out. If you look at my pumpkin pie, you’ll see a weird shape that looks just like Africa where my pie cracked. If your pie does crack, take a wet palette knife and gently spread over the crack, It’ll smooth itself out and your guests won’t even notice. 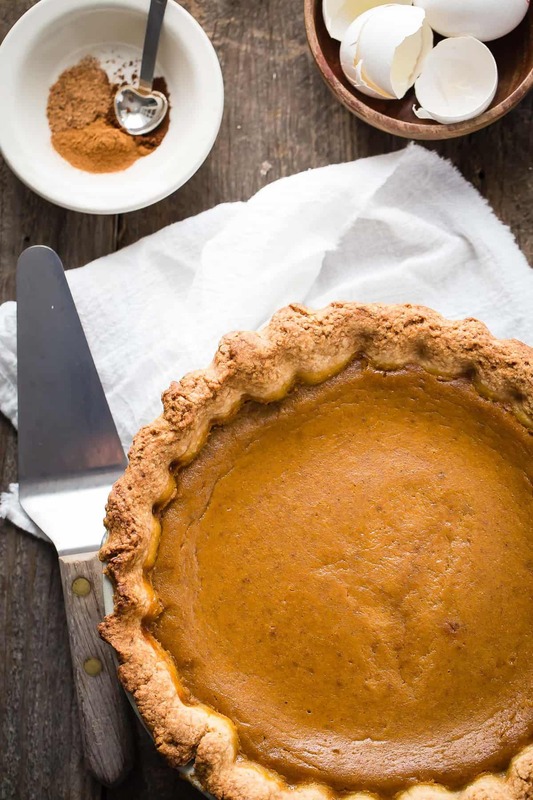 A traditional classic pumpkin pie in a rich buttery crust. Serve with whipped vanilla cream. In a bowl, add the brown sugar, white sugar, salt and spices. Mix well. Add the eggs and egg yolk and whisk. Mix until the mixture is no lumpy. Pour the liquid mixture into the pie crust and bake for 15 minutes. Turn down the temperature to 350 and bake for a further 60-70 minutes. Let the pie rest and cool completely before slicing. There’s nothing like pumpkin pie at Thanksgiving! I love mine warmed up with whipped cream on top. I don’t thik I’ve ever warmed my pumpkin pie, sounds delish Tonia! I have to adapt my pumpkin pie recipe for lactose intolerance. Any suggestions? Thanks for sharing your take on such a classic! I’ll have to try it out! Simple and Beautiful. I love it! You are definitely making me excited for the holidays!! Love your photos too. Everyone needs this recipe! Nothing better than a classic pumpkin pie for the holidays! 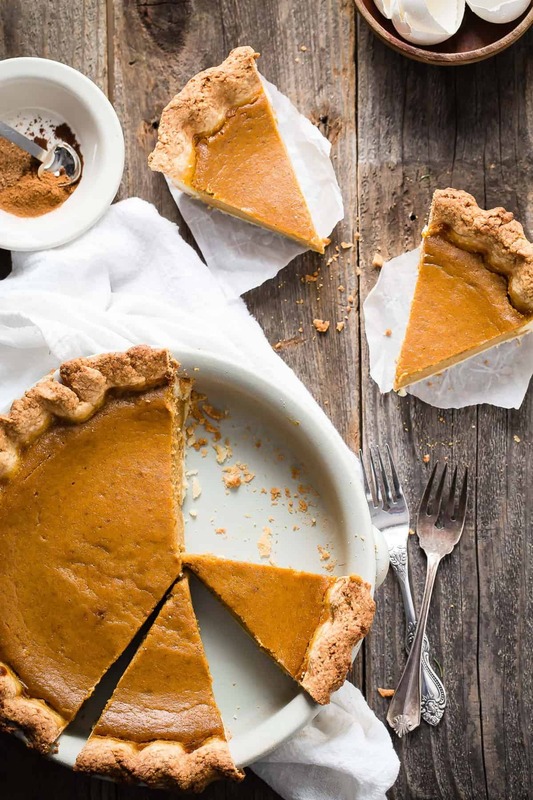 Classic Pumpkin Pie is the absolute best! This is gorgeous. This looks great. Love the simple recipes as much as the elaborate ones! Gerry, that crust is gorgeous! 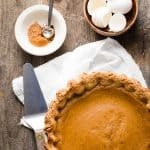 There’s nothing like a classic pumpkin pie, it’s my favorite dessert on our Thanksgiving table. This is a pumpkin pie perfection, Gerry! Classic dessert at it’s best! So gorgeous, pumpkin pie perfection! You can’t go wrong with a classic pumpkin pie. Using a wet knife to smooth over cracked pies…such a neat trick!